These little scissors have been around forever, different versions date back to the 1800’s. 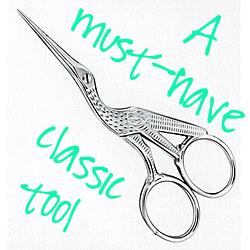 The Tweezerman Stork Scissors are sharp, pointy and oh so cute and tiny. They can be found everywhere – Target, Walmart and online. Don’t tweeze out grey hairs, instead cut them short and color the whole brow. Comb (with mascara wand) the brows up and then down to decide where you can trim. Hold the hairs out straight and cut with the curve of the brow. You may need to leave longer hairs (think comb over!) to cover scars or bald patches. If your brow is very dense, do sporadic diagonal cuts in the brow body (not sure you want to try this at home ;-), but it looks great. Many times the brow “head” is thicker than the “tail”, cross cutting helps create balance. A professional is recommended, at least periodically for shaping. And if your in my area, I’d love to see you personally! Hint – If your scissors ever stick, put a drop of oil in the joint and work back and forth to loosen.